The beginning of an anime season is our chance to pick up new noteworthy productions to detail their ins and outs on a consistent basis… but that’s not quite what we’re here to offer this time around. Plenty of shows offer their share of highlights even if they don’t justify our usual level of coverage, particularly in seasons like this. With that in mind, we’ve decided that it’s only right to offer irregular analysis of them as well, focusing on their most impressive outings rather than examining the production as a whole, even as we keep the overall context in mind. 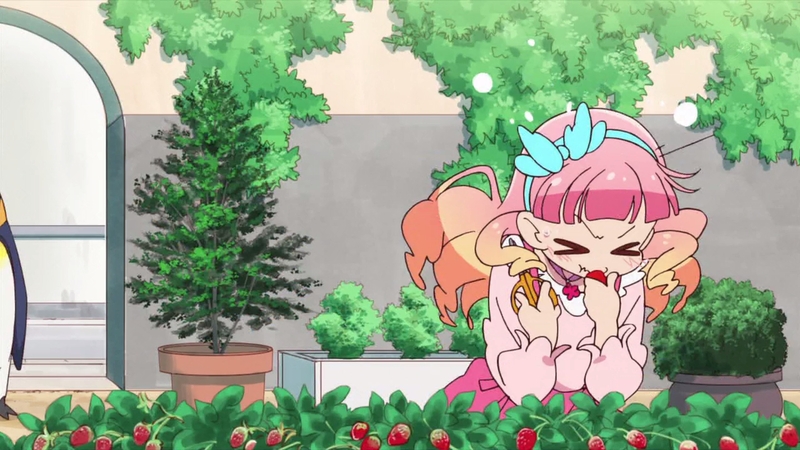 We’ll be kicking this series off by taking a look at the premiere of Aikatsu Friends: its place within the franchise’s production, the team behind it, and their prospects for the future! — Before we dive into the episode, I should stress that you shouldn’t expect regular coverage when it comes to this series. That’s not because there aren’t interesting elements to it, but rather due to the restrictions of long running productions. Shows like this, which are guaranteed to run for a year minimum, are manufactured to accommodate a regular staff rotation that will hopefully lead to a stable schedule and a manageable workload for everyone involved. It’s not difficult to understand why this is essential when we imagine the results of a 12-13 episode series falling apart and apply them to one that’s at least four times as long. 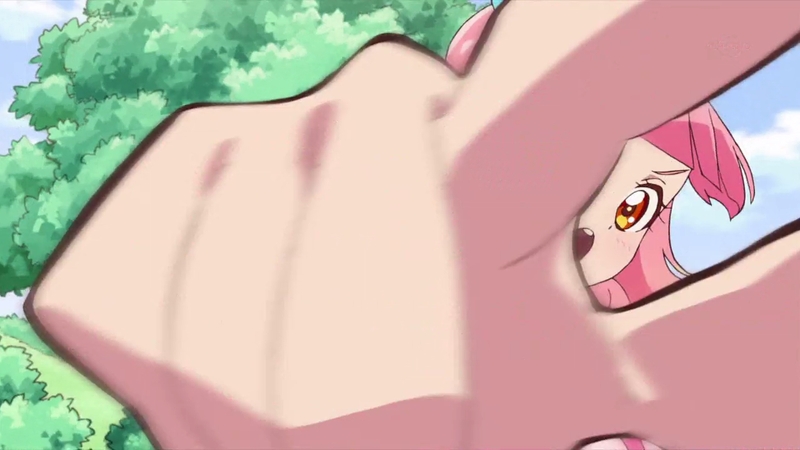 As the most recent installment in the Precure franchise proved by having what may just remain the most impressive episode of the year though, there’s no rule that these productions need to hold themselves back at all times, more so when they’re supported by a team who have the potential to deliver quality work on a consistent basis and without a negative impact to its schedule. With all that in mind, our coverage this time around will be focused on the episodes that stand out most rather than all 50+ of them, and will go up whenever there’s enough material to merit a full post rather than on a regular schedule. — Unsurprisingly the premiere means there’s plenty to highlight and discuss, but it wouldn’t feel right not to start off by simply saying that, on a base level, I very much enjoyed what we’ve been given so far. 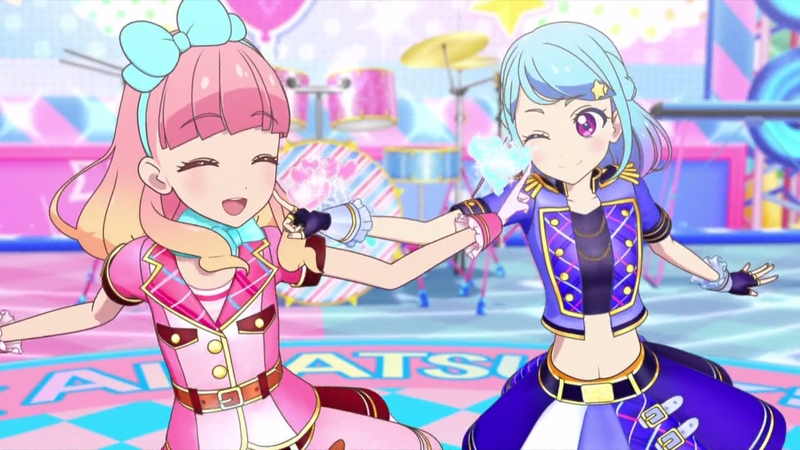 Aikatsu Stars ended its run having earned a special place in my heart, which I wouldn’t have anticipated during its early days. 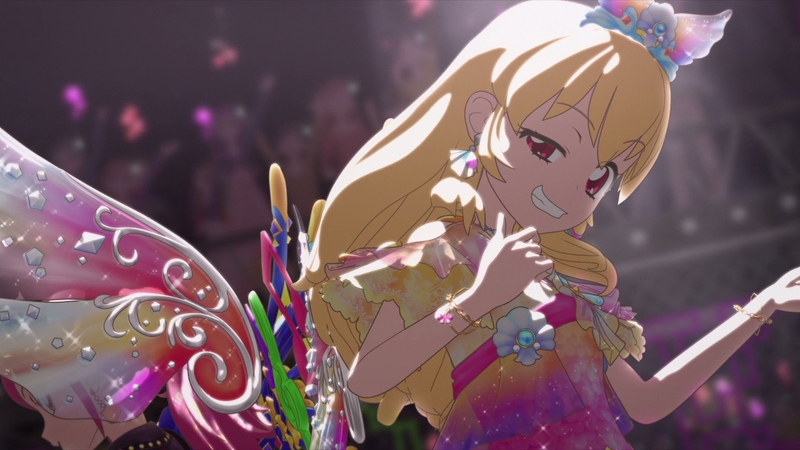 While the reasoning behind my less-than-positive reaction at the time isn’t worth going into here, I can say with confidence that Friends establishes its own identity right off the bat without losing the charm that makes Aikatsu so endearing in the first place. I was a bit concerned considering series director Tatsuya Igarashi has done rather minimal work on the franchise, skipping Stars entirely after working on a handful of episodes in the original series, but those misgivings seem to have been unfounded so far. 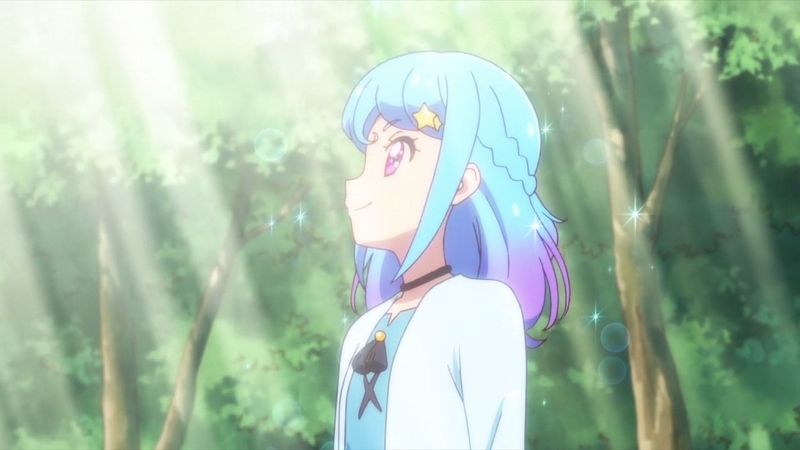 — The deliberate approach to lighting throughout the episode caught my eye right away when I checked out the first half, which was officially uploaded a few days prior to its broadcast. 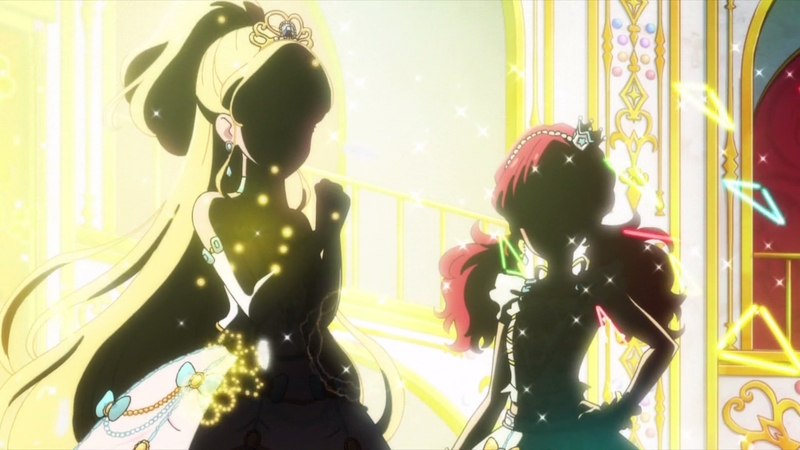 Sunlight pouring through the trees provides some extra oomph to our first impression of Mio, but gives us a window into how Aine first perceives her as well, while the backlit silhouettes of Love Me Tear gives their appearance the imposing presence you’d want from the industry’s top unit, the rival to beat. None of this is a truly innovative quirk, but I feel pretty confident that episode director Koushou Fujii may have found himself being influenced by the work of current series star Naoya Ando judging by its consistent presence and the similarities between his output and Ando’s early experimental stages, doubly so in even the most minor moments. There’s an obvious gap in quality when it comes to their execution, but it’s hard not to smile when Ando’s dedication to cultivating his own skillset has seemingly made an impact within this very tight-knit team. — On the topic of the team itself, I’d like to use this episode as a platform to introduce readers to Risa Miyadani. 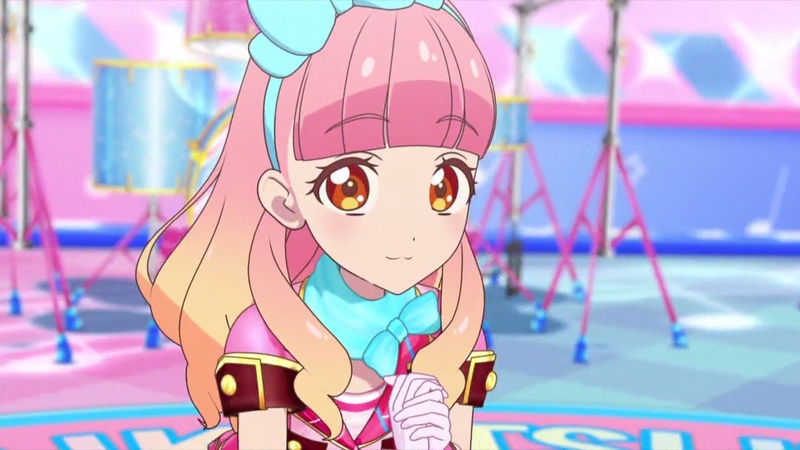 We can avoid going too in-depth for now, since there will be plenty of opportunities later down the line, but the major takeaway is that she’s arguably one of the most important members within the once called Studio Aikatsu at the moment. 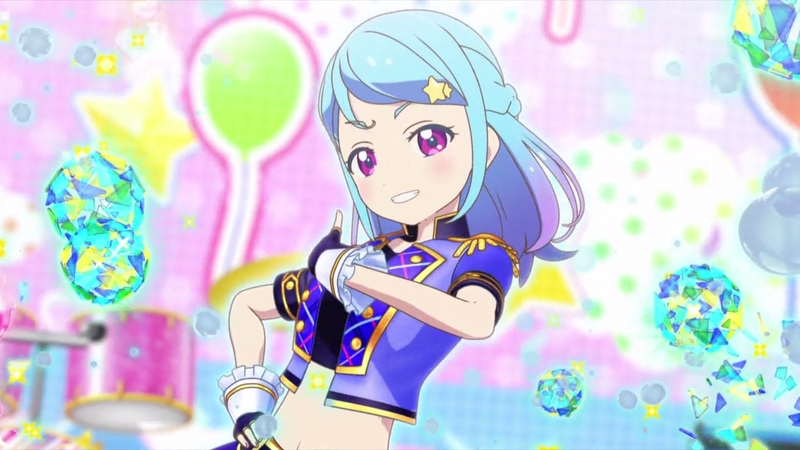 A mainstay in the franchise since the original series’ second season, with two main characteristics that have allowed her to establish herself as one of the most reliable supervisors within the franchise; first is her art itself, of course, as you’d expect from one of the most consistent supervisors in the team. Her work isn’t just strong on a technical level – much like other popular animation directors, she stands out by adding her charm rather than sticking to the base designs, so she won’t hesitate to drop detail in favor of her own brand of cute, fun round art. 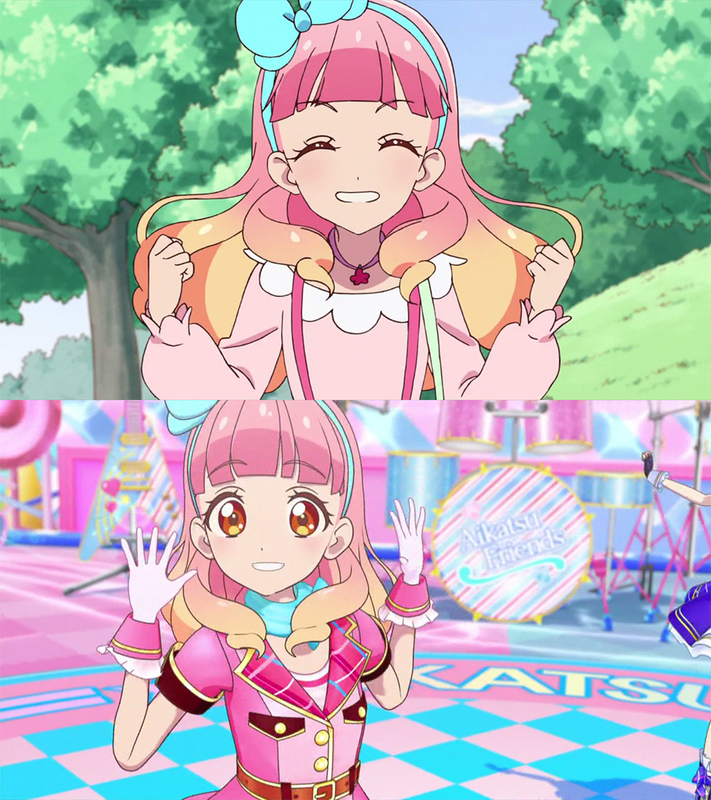 And beyond that, there’s a simple yet important point to explain why she’s grown to be integral to this crew: her compatibility with the design philosophy and visual identity of Aikatsu!, which is as evident in her episodes as it is outside of the show itself. 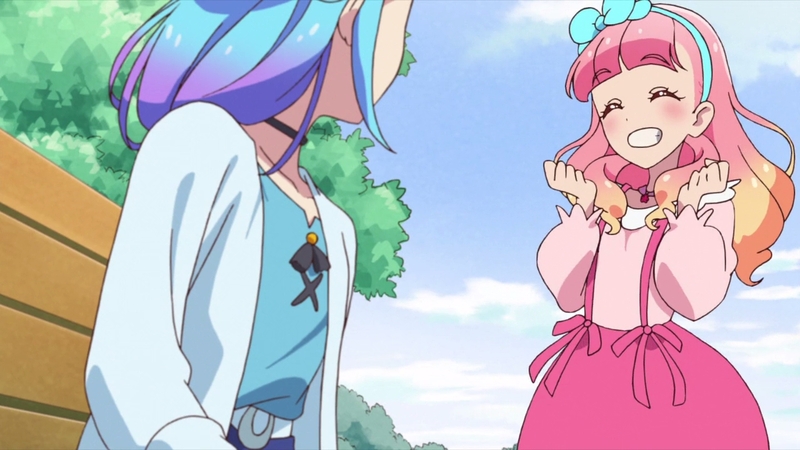 We can save the story of how she came to inherit this for another time; just keep in mind for now that Miyadani is shaping up to be the new successor to a key figure of the franchise. — Watanabe’s confirmation that Takeshi Morita both storyboarded and animated the amazingly over the top changing room stock footage made me laugh considering how he’s known as an action animator and his involvement on some of the wildest scenes in the franchise. One of those moments where you can’t help but think “of course!”. We’ll have to wait and see if he’ll be in charge of every character’s take on these scenes, but I personally hope he is, if only because the sky is the limit when it comes to the stunts the Love Me Tear duo can pull before getting dressed. 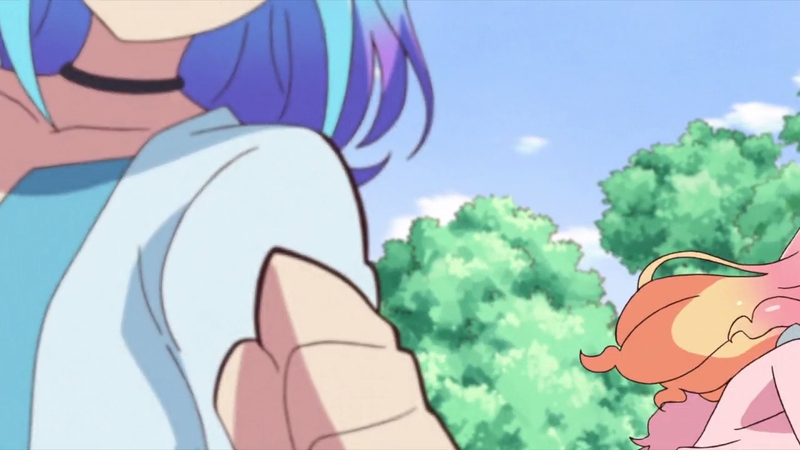 Assuming he didn’t do anything else in the episode, I’m curious about who was responsible for the noticeable outlines during the first half since I originally assumed it was him based on his previous work. Perhaps they’re part of Miyadani’s corrections as opposed to an animator’s quirks, but personally, that wouldn’t be my guess since she’s never done that before. 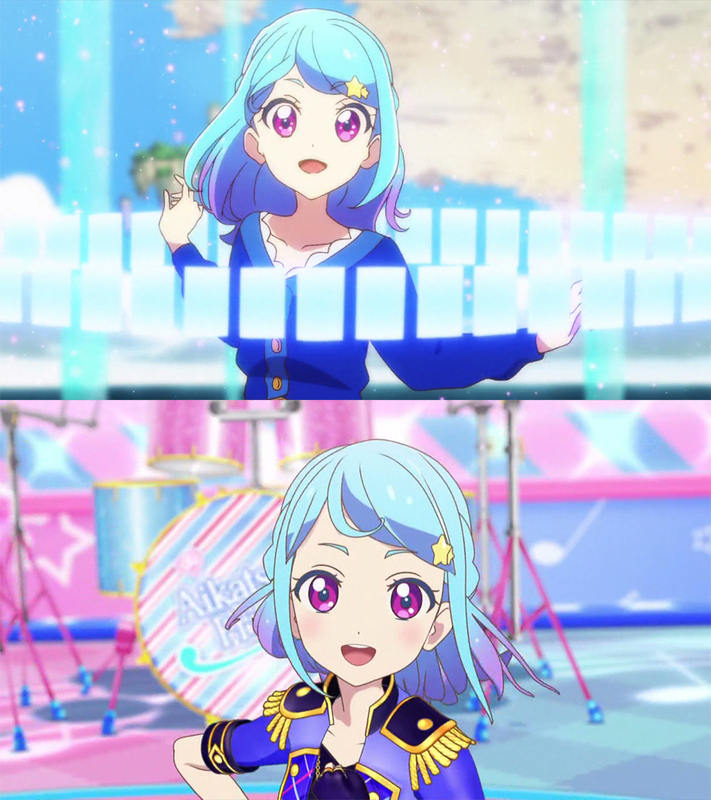 — Anyone who found themselves thinking that Aine and Mio’s performance felt more reminiscent of the original series is on the right track. 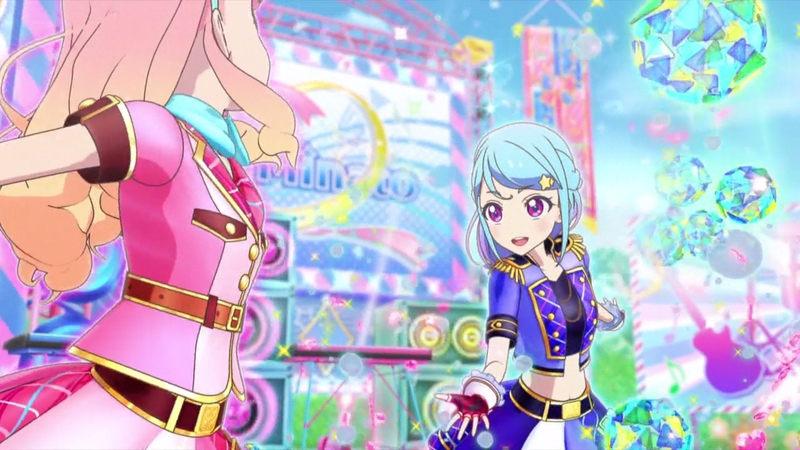 The production of Aikatsu!‘s CG performances was originally in the hands of Samurai Pictures, a studio whose main bulk of work came from outside the anime industry. 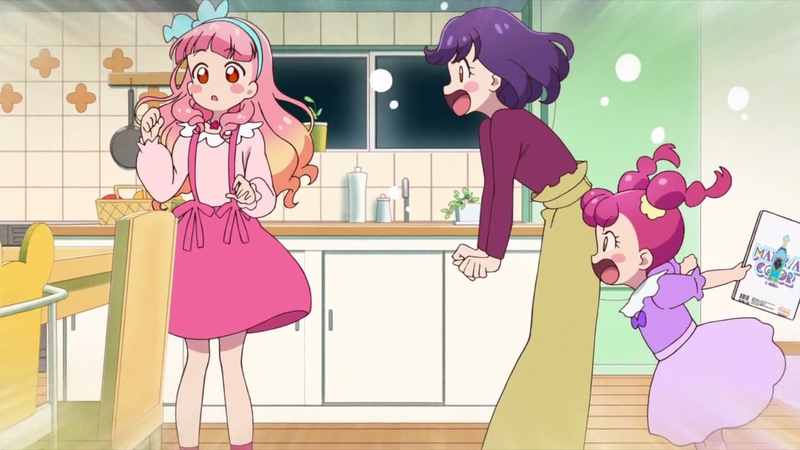 Their first contact with the franchise actually came a bit earlier though, being in charge of the arcade game that spawned the anime, which was reflected in the show’s early outings. Being still relatively new at the time, the results were far from positive, but that only made their growth even more impressive. 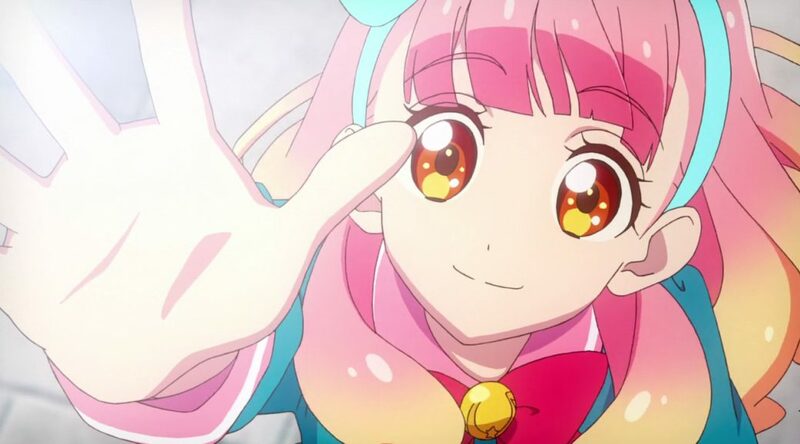 Their exploits through the years, which are well documented by lovely fans, make it difficult to argue that they aren’t one of the forerunners in raising the bar for CG in anime, moreso when you see how their sequences are as creative and exciting as they are technically impressive. However, that momentum came to a halt with the end of the original series, as they were relegated to minor modelling assistance while Sunrise’s in-house CG studio D.I.D took over main production duties. If you wanted to pinpoint a reason for the noticeable downgrade in the quality of performances between series, then there you have it. What about the sudden spike in Friends, then? D.I.D are still the main team responsible while Samurai Pictures are credited for assistance, but signs seems to point to them taking on a more invested level of assistance instead of being tasked with the bare minimum. It’s hard to say when nothing’s been made 100% clear just yet, but a jump in quality like this more often than not means some sort of restructuring has gone on. — With the info dump out of the way, let’s take a quick look at the performance itself. The immediate takeaway is that the models themselves resemble the original designs much more than in Stars, thanks to smart use of shading and highlights to create an effect similar to their 2D counterparts, much like how they did so in the original series. 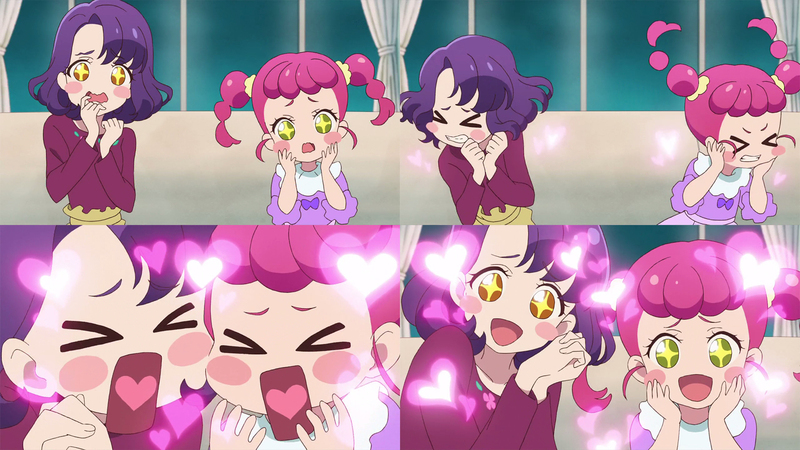 Their expressiveness served as a pleasant surprise, too, particularly in regards to the dynamic between Aine’s cute and Mio’s cool factors. 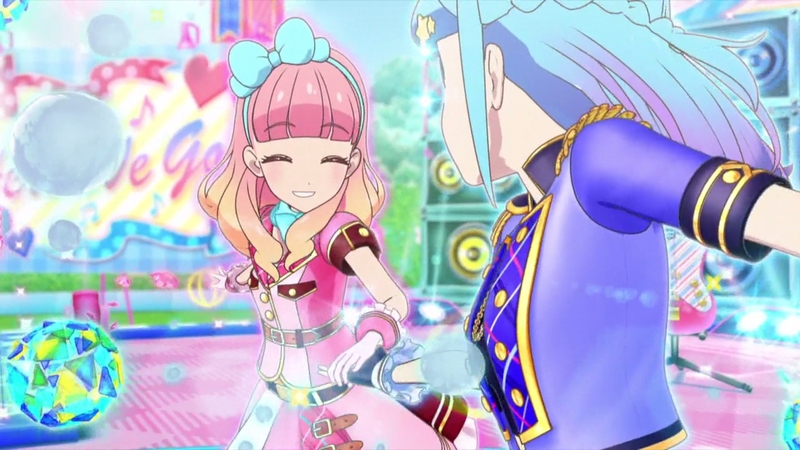 With plenty more characters to introduce and mix together, including Love Me Tear themselves, there’s lots of potential for performances filled with unique personality. Who knows, we might even be lucky enough to experience something similar to Ichigo’s legendary moment all over again. — One final note is that the schedule itself seems to be in a healthy state. The official site updated with staff listings up to episode four back in mid-March, which is impressive considering it’s a whole six weeks in advance. Admittedly this wasn’t much of a concern in the first place, but it’s always nice to receive confirmation on these things. Series director Tatsuya Igarashi will be making an appearance in Persona 5 next week as he drew the storyboards for the second episode, which is something he might not have been able to afford in the first place if his main job wasn’t on the right track. — Sometimes the things you expect can be better than surprises…is what I’d say if Ando didn’t strive to surprise every single time he shows up at this point. 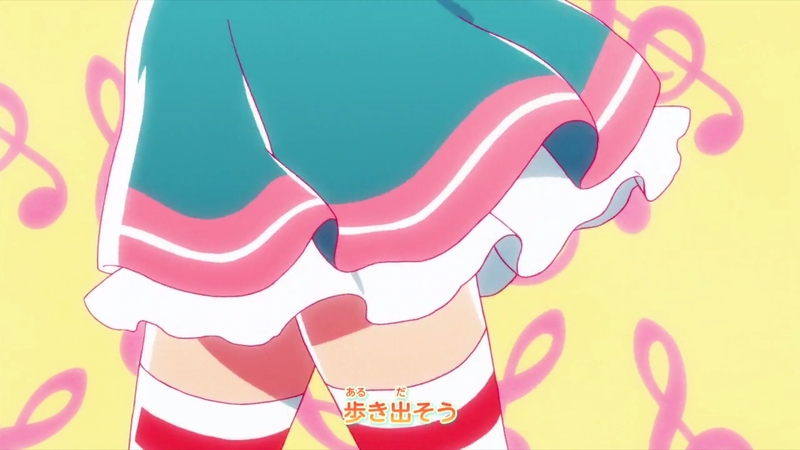 Him having full control of the OP was well within expectations, but the use of cute, pastel colours to evoke a feminine charm is a side to his work that he hadn’t put on display before. His sense of staging and always memorable lighting play fundamental parts as well, but seeing him aim to develop new facets to his work instills further confidence in his future prospects. 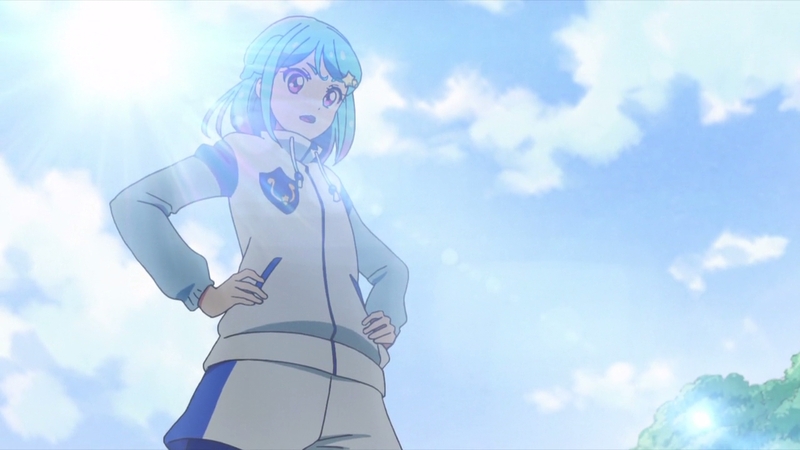 — Hironori Tanaka’s appearance deserves a shoutout all on its own by virtue of it being his return to the franchise after four whole years. 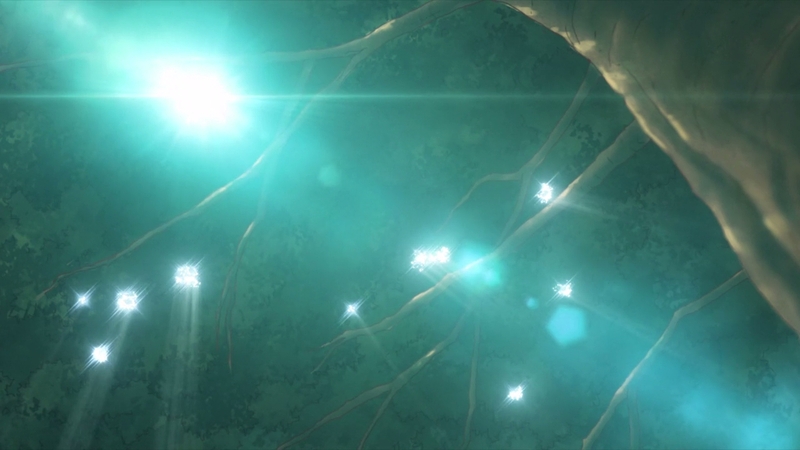 It’s amazing how the CG of Samurai Studio evolved in the first serie. The work of Naoya Ando in the OP is great. I think the most impressive part is that they never did stop making improvement along the way, even as the series approached its final episode. I held back on talking about other factors thanks to the post being too long already, but hopefully they’ll give me an excuse to do so in the future. 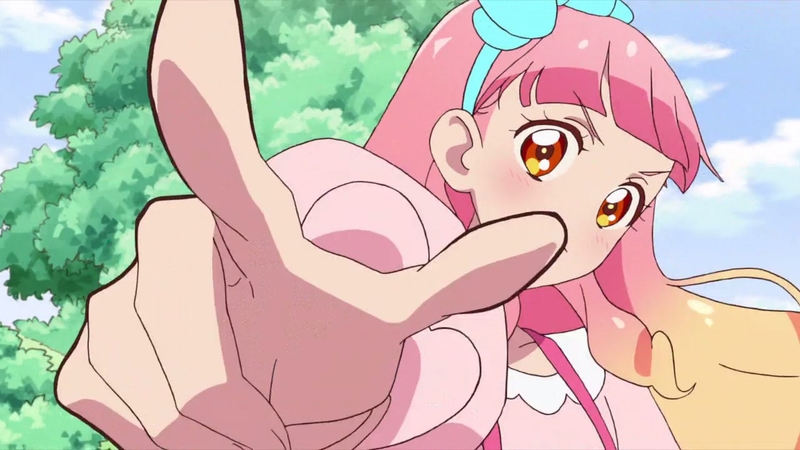 The OP is great since you can feel his touch even during the more lowkey parts of it. Really can’t wait for his eventual episode as well.